Last week the European Union Advisory Mission (EUAM) Ukraine conducted no fewer than four study visits to various EU countries for staff from agencies of Ukraine’s civilian security sector. Such study visits are a useful tool in passing on best European practices in specific thematic areas, and instructive for EUAM’s partners as they adopt reform measures. 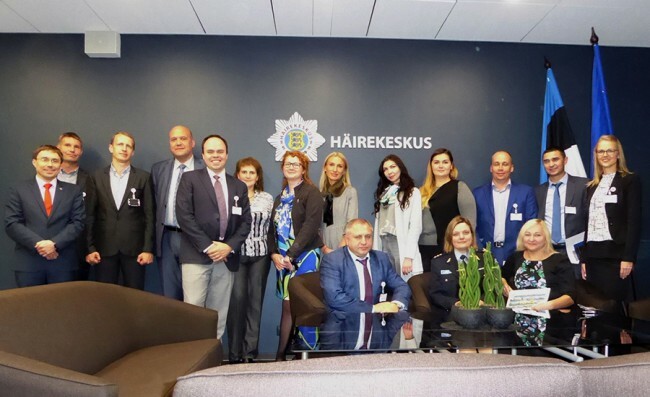 From 26 – 30 September, representatives from Ukraine’s National Security and Defence Council, Ministry of Internal Affairs, National Police, Security Service and Presidential Administration participated in a EUAM study visit to Estonia and Finland. The aim of the study visit – organised for public servants responsible for strategic and financial planning – was to introduce Estonian and Finnish practices in strategic and medium-term operational and financial planning as well as performance management of the central executive bodies. The need for a study visit arose from a workshop held in Kyiv in mid-summer, where the planning challenges of Ukrainian civilian security sector agencies were outlined, namely a lack of experience in strategic planning, weak coordination mechanisms, lack of inter-agency cooperation and information-sharing between institutions. On 26-27 September, EUAM facilitated the first visit of Ukrainian prosecutors from the Specialized Anti-Corruption Prosecutors’ Office (SAPO) to meet their counterparts in the Romanian capital, Bucharest. This study visit was part of a project to support Ukraine’s anti-corruption institutions that is being implemented by Romania’s Public Ministry in 2016-2017. On the first day, SAPO prosecutors had six meetings with senior officials and prosecutors from the National Anti-Corruption Directorate (DNA) of Romania. DNA speakers shared their 14-year experience of institutional development, which elicited over 20 questions from Ukrainian counterparts, ranging from legislative provisions to public communication. On the second day, the SAPO delegation went to Romania’s Prosecutors Office to meet with two senior prosecutors. The Romanian counterparts prepared a thought-provoking case study from their experience of investigating minor corruption crimes, which was followed by an hour-long discussion with SAPO colleagues. As part of EUAM’s continued support to Ukraine’s anti-corruption agencies, the Mission brought a delegation of higher managers from the National Agency for the Prevention of Corruption and the National Anti-Corruption Bureau to Slovenia on 27-28 September. The study visit focused on areas such as Slovenia’s anti-corruption policy, investigation of corruption in Slovenia, asset declaration, and whistleblower protection. The study trip also established solid working relationships and the basis for future cooperation, with the Slovenian agencies visited offering their professional support to assist the Ukrainian agencies’ further development. A delegation of four senior National Police officers travelled to the UK as guests of Northumbria Police from 26-28 September. Northumbria, in north-eastern England, is the 6th largest police force in England with some 3,500 officers and 1,500 support staff. The force is well regarded as a national exemplar of the Community Policing philosophy and the purpose of the visit was to expose the police officers to the experience of Northumbria Police in planning, implementing and managing community policing methods.